I consider myself extremely fortunate in some regards as a blogger who used to live in Japan and now does not. One of the big ones is my unimaginable access to Japanese food from my current location. If I lived in my home town, well, let's just say there'd be nothing to write about or I'd have to rack up extremely hefty mail order bills by getting things from agencies that sell exported Japanese snacks. Though I knew shelf stable items would always be possible, I didn't think fresh fruit and vegetables would. I was thrilled when I found "kabocha" (Japanese pumpkin) at local markets. In fact, I was shocked at just how often I could find it. After a few rounds of cooking with it, and noting that it was grown in Mexico, the excitement vanished. The kabocha that I tend to have access to tastes like a cross between a squash and a cantaloupe. There is something of a strange aftertaste to it. Clearly, a kabocha by any other name does not taste as sweet. The lesson I learned was that it may walk like a Japanese duck, talk like a Japanese duck, but it doesn't taste like a Japanese duck... not that I have ever eaten a Japanese duck. My experience with the kabocha showed me that produce can be marketed as being like what I loved, but not actually taste like it. 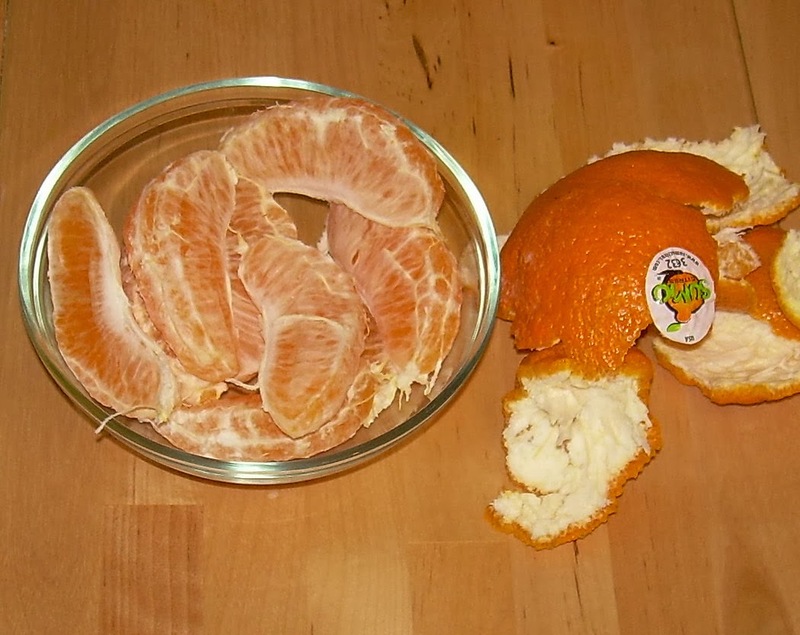 With that thought in mind, I approached the "Sumo Citrus" entity that is often marketed as "Japanese mandarins". What they are, ostensibly, is dekopon, a type of Japanese orange which is available in the winter and is sweeter and more flavorful than your average orange. Finding Sumo Citrus is not easy. They have a limited number of stores carrying their produce. If you are going to try and track some down, I'd recommend calling the stores listed on their web site to make sure they have them first. And, I'm going to tip my hand and say that you are going to want to find them if you like oranges a little because they are fantastic. They are every bit as good if not better than the dekopon I bought in Japan. The only down side to these oranges is that they aren't cheap. Whole Foods, which is where I got mine, is selling them for $3.99 a pound. One orange will cost you about $2. Though that is a pretty large orange, it is a splurge. At the very least, it is a healthy one. Finding them at Whole Foods was more of a chore than I expected. We went in through one of the entrances and walked the length of the front of the store to the produce section. After casing the entire produce area, we had to ask someone where they were and they were in a display outside and in front of the other entrance. As we approached the display, a woman was picking one up and saying that they were really good, but expensive. We told her that we'd had them in Japan and that they were very, very good. As my husband talked to her about our past experience, I picked out the ugliest, most pock-marked-looking and old-looking ones. My husband asked me why I was taking those ones and I told him that the worst looking ones were the sweetest. In Japan, it's common to pick them then allow them to age a bit so their natural sugars develop. So, if you decide to have these, don't go for the pretty ones. The ugliest one from our bag was nearly as sweet as candy. These are seasonal and available in a limited area. I wish more growers were providing them, but Sumo Citrus is the only one I know and there is a risk that they won't produce many (or at all) next year due to the drought in California. Get some while you can, if you can. They're really worth it. Hi. 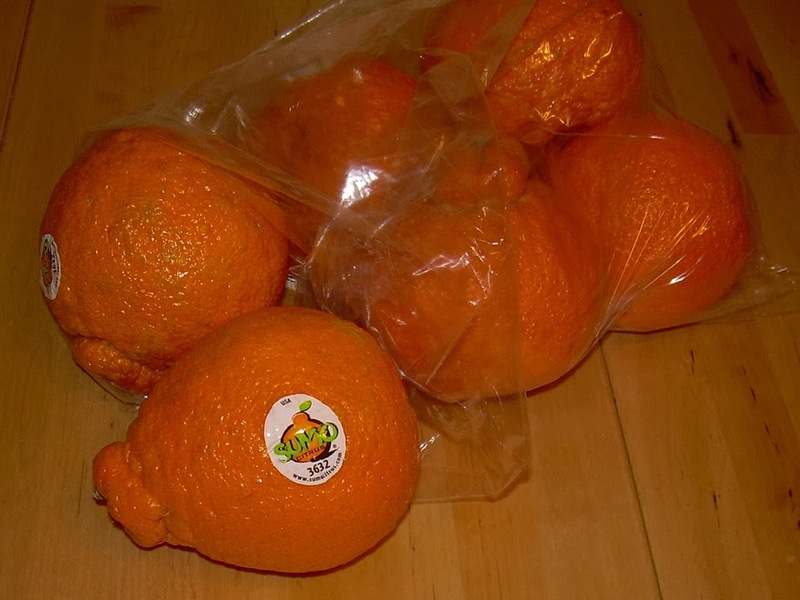 Just saw the big display of these "Sumo" oranges at the Nijiya here in SF. My friend bought me one, it was very yummy. I remember living in Japan in 1990 and writing(no internet then!!) about how a single orange cost about a dollar there...At $3.99lb I'm sure these are more than that.